TRAVEL COLUMBIA RIVER GORGE: Looking for Lunch in the Gorge? Bridgeside serves breakfast, lunch and dinner seven days a week. Under new ownership since July, 2013, the former Char Burger restaurant was completely remodeled and updated in 2014. In 2015, the new owners decided to change the name from Char Burger to Bridgeside to better describe the restaurant’s incredible location next to the Bridge of the Gods. The new name is also more inclusive for the variety of menu items Bridgeside offers for breakfast, lunch, and dinner. And finally, we hope it will enable us to better promote the special event space with its stunning views. 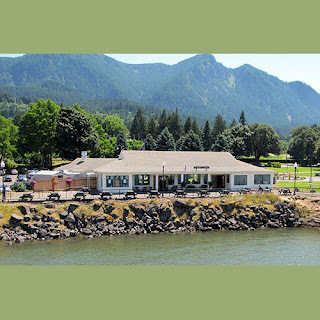 Bridgeside retains the historic character and memorabilia for which the Char Burger in Cascade Locks was well known. Bridgeside is the perfect traveler’s restaurant for visitors of the Pacific Crest Trail, Historic Columbia River Highway State Trail, Multnomah Falls and other Columbia Gorge waterfalls and attractions. We also enjoy serving long-time locals, and folks just passing by.